In its high quality and dividend yield screen, BofA/Merrill Lynch added BA and CMI. Since inception, the High Quality and Dividend Yield screen has outperformed the S&P 500 Total Return index by 146ppt (4.8ppt per year). 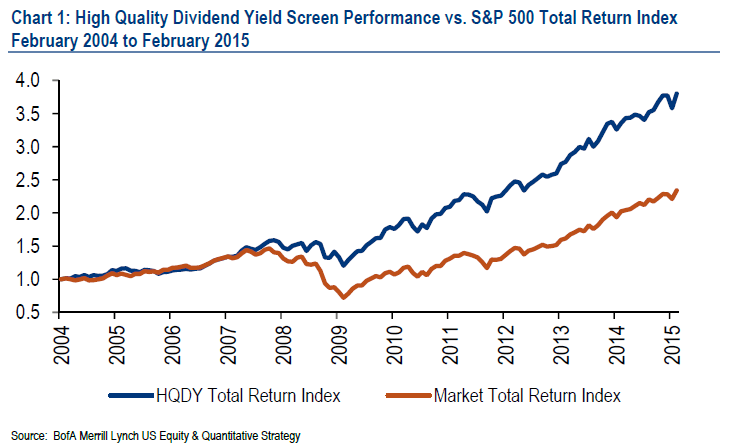 In February 2015, the High Quality & Dividend Yield screen outperformed the S&P 500 by 0.4ppt, with a total return of +6.2% versus +5.7% for the index. Current constituents of the screen offer an average dividend yield of 2.3% versus the S&P 500’s dividend yield of 1.9%. Boeing (BA): S&P Common Stock Rank changed from B+ to A-. Cummins (CMI): Dividend yield is now higher than that of the S&P 500.
from the S&P 500 and exclude financial stocks due to metric incomparability with other sectors. growth and stability of earnings and dividends over a 10-year period. Return on equity (ROE) greater than that of the S&P 500 ROE. Debt/Equity lower than that of the S&P 500. Trailing 12-month dividend yield greater than that of the S&P 500. BofAML opinion indicates “Buy” or “Neutral” as well as the likelihood that the dividend will remain the same or be increased (i.e., a dividend rating of “7”). The ratio of the last 12-months’ free cash flow to dividends (FCF/Div) must be greater than 1.0.